In honor of a century of making music in L.A., L.A. Phil 100 x CicLAvia’s Celebrate L.A. is taking over the city for a massive birthday party on September 30. They’ll be setting up an eight-mile route from the Walt Disney Concert Hall downtown to the Hollywood Bowl, with performances and activities all along the way. Starting at 9 a.m., audience members can drop in anywhere along the route. There will be free, ticketless performances going on at six “hubs” along the stretch: Grand Park, MacArthur Park, Koreatown, Melrose, Hollywood, and then the Bowl itself. Almost all of the hubs are located near Metro stops if you prefer to hop between them that way, rather than walking or biking the entire stretch (or you could drive, too, if you’re into that). Among the performances confirmed for the hub stages will be Phoebe Bridgers, Pink Martini, Georgia Anne Muldrow, the USC Trojan Marching Band, Dustbowl Revival, and ensembles of the L.A. Phil and Hollywood Bowl Orchestra. Also along the route will be activities and workshops for kids and adults, from yoga to arts and crafts, and even an ‘instrument petting zoo,’ so you can finally find out if the bassoon was really your true calling all along. In order to accomodate the performances and crowds, there will be some street closures for the event. 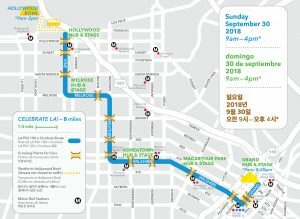 Western Avenue from Wilshire to Melrose, Melrose from Western to Vine, and Vine from Melrose to Yucca will all be shut down from 9 a.m. to 4 p.m. After 4, most of the outdoor stages will start to close down, but Grand Avenue will stay partially closed, because the party at the Music Center continues until 8:30. 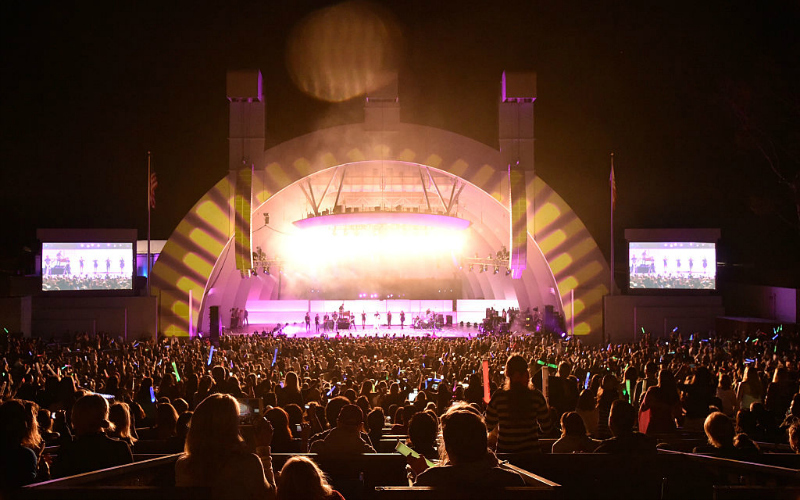 From 9 a.m. to 2 p.m., the Hollywood Bowl will be open to all as one of the hub locations. After that, it’ll close briefly to prepare for the night’s climactic concert, L.A. Phil 100 at the Bowl. That event, which is free but does require claiming advance tickets (an online lottery for ticket distribution will open August 20), is set to feature Katy Perry, Kali Uchis, Herbie Hancock, the Youth Orchestra of Los Angeles, and Gustavo Dudamel conducting the L.A. Phil.